QuickTime for Windows 10 – If you don’t know, What is QuickTime then don’t worry let us explain in simple words? QuickTime is a player that is widely popular and used as Audio and Video player for Apple Devices. Apple design and develop QuickTime Player for iOS users that allow users to play movies or any media content. The QuickTime for Windows 10 term is search by thousands of Windows users, and as you guys know that we at WindowsPCSecrets always try to provide you best things for Windows operating system based devices. So if you also want to Install QuickTime for Windows-based devices than you have landed on the perfect post, because we are going to provide you Easiest Methods to install Quick Time for Windows 10 PCs. With QuickTime, you can run any videos especially the once that are loaded on the Apple different websites and if you also wish to use a different codec than ProRes 422 HQ, we have to set some settings in the file with the assistance of our script. You need to have high excellent video encoder for it. But if you want to download QuickTime for Windows 10 then we have an easy method for our WindowsPCSecrets audience. Here in this guide, you can learn how to download and install QuickTime App for Windows 10 based PCs. You don’t need any setup required to run and watch online videos because it will automatically detect which connection speed your Windows 10 PC and which bandwidth is good and perfect to use. QuickTime Player for Windows 10 will automatically configure to run videos. QuickTime is Apple’s property video format, and QuickTime player is the official player for this. More Details HERE. As you guys know that, Apple QuickTime isn’t officially available for Windows platform, as Apple stopped their support for Windows back in Jan 2016. While QuickTime is not supported officially Windows, but it is still possible to have QuickTime on Windows 10 running devices or older versions of Windows. This detailed guide will give you exact method of installing QuickTime download for windows, and it also provides you with alternatives that you may use instead. The official download page of Apple QuickTime for Windows is still up, and the latest version released is QuickTime 7.7.9 for Windows. Apple notes that “QuickTime Player for Windows”, make sure you have to go through the features and then later you can have QuickTime Player Free Download. Note: Before you download QuickTime player for Windows and install it on Windows, make sure you have the latest version of Windows which is Windows 10. You can rearrange pieces of a clip here if you want, and it is possible to trim regions of the clip you want to delete. While playing a third HD CLIP would set you at 93% of the most bus bandwidth of the machine. Not only this, if you want to create videos that you can use QuickTime too. In the back part of your mind, you might want to know how people watch your videos they ought to be clicking the video. First, you need to download QuickTime for Windows via this LINK. Now, Follow on-screen instructions to install QuickTime on Windows. Once you installed this software, you can watch any movies that you would like to watch. The standalone QuickTime Player is quite easy to use for anyone. It is possible to embed another video player that can take care of your video experience. The VLC media player is the most likely used by millions of video watchers to play their favorite media content like music or video files. There are so many Apps Like QuickTime but still, there is not any alternatives of QuickTime. You can split audio files, and you can trim that audio file, and you can add different clips. QuickTime player also allow users to record their sound, videos and screenshots in a wide range of manners and manages an extensive selection of subtitles. You even have the choice of sharing with selected services online. You can capture an area of videos with QuickTime Player that allows you to record a portion of the screen, including a particular Window. You can proceed and check it and close the window. Converting audio and video file to some other file format is among the principal features of QuickTime Pro. It may be an error in the Apple tutorial, or it may be a version compatibility issues. QuickTime is no longer needed? Well, QuickTime is no longer needed on the Windows operating system based devices. If you just want to add support for formats that Apple pushed. Then you can use other media players for Windows that support all formats. You can pick, VLC Media Player, SMPlayer or any other media player. Even Windows Media Player supports the QuickTime Movie Format. First, ask yourself that do you need QuickTime on Windows Machine? The Answer is probably NO unless you really want to run the programs that do rely on it. Apple QuickTime for Windows 10 installs three different software programs. You need to remove all three again from the system and can do that in the following way. Type Windows + I to open the settings app on Windows 10. Now select Apps > Apps & Features if you run the creators update, or later. Select QuickTime with one tap, and then the uninstall button. Follow instructions to remove QuickTime from Windows PC. Repeat the process for Apple app support, and Apple software update. 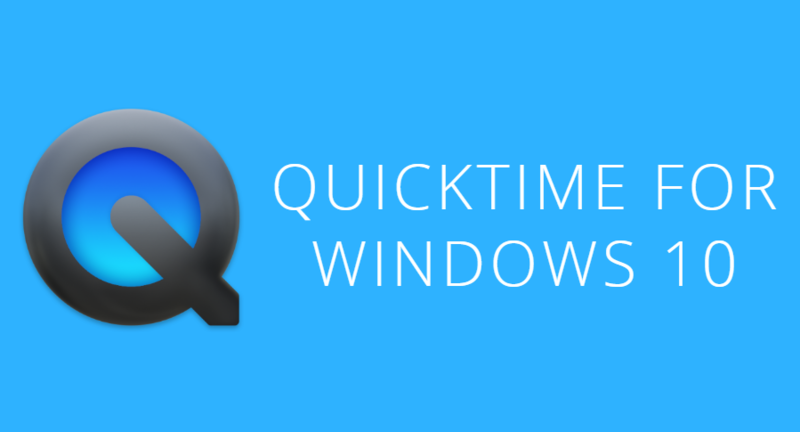 We have shared almost all information regarding QuickTime for Windows 10 and related stuff. If you still have any doubt then please drop them in the comment section below and we will get back to you as soon as possible.